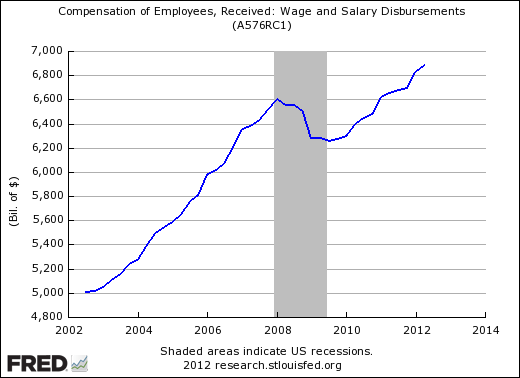 Even though there are many unemployed and underemployed, the total amount of wages being paid into the economy is greater than in the pre-crash period. That is a positive for the economy, even though there are many individuals and families left behind. 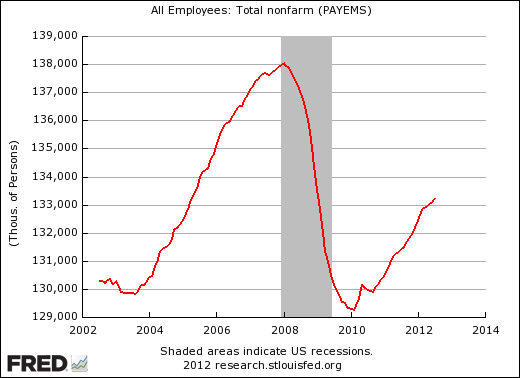 The total number of jobs is still nearly 5 million lower than before the last recession. Total jobs lost as a result of the recession were about 9 million, somewhat less than 1/2 have been regained. Part of that is due to substitution of capital for labor, and part is due to working employees harder. While the economy is moving forward, the visible unemployment creates a sense of worry among the employed and among investors that makes the glass seem more half empty than half full. 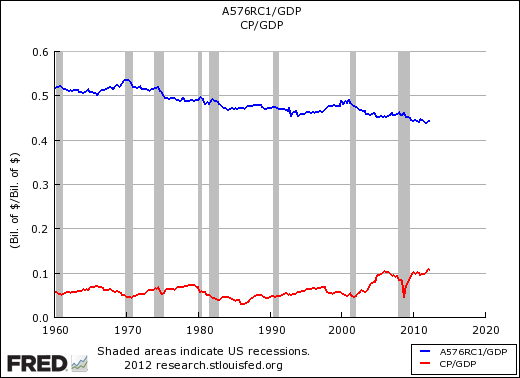 Wages as a percentage of GDP has been declining since 1970, and is at an approximate low. At the same time, corporate profits as a percentage of GDP rose significantly after 2000, took a steep dive in the last recession, but are now a larger part of GDP than before the recession. The contrast is probably part of the social unrest over the “haves” and “have nots”, but for investors it should be noted that corporations are doing well. In a prior article, we showed that US non-financial corporations have a better ratio of cash and short-term investments to total liabilities than they had before the 2008 stock market crash. Similarly. we showed that households have a lower debt service burden to disposable income (and a lower total financial obligations to disposable income) than they did before the 2008 stock market crash. Things are better, even though there is headline gloom over unemployment and a slowing global economy. This entry was posted on Wednesday, September 5th, 2012 at 12:29 AM and is filed under Data. You can follow any responses to this entry through the RSS 2.0 feed. Both comments and pings are currently closed.